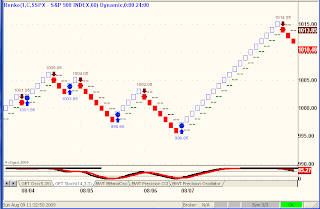 How many trading systems do you see on this sixty minute SPX chart? 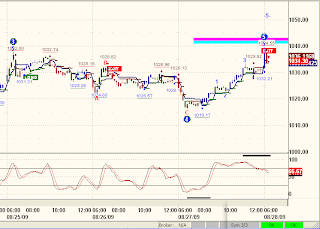 Prices hit their initial Sell thresholds from Saturday's analysis on the 30 and 90 minute charts. The Dailies are next, those are biggies. MC is on a Daily Sell, takes 980 or lower for Weekly to follow. They are all in tune, or getting there. Things are getting pretty interesting again, due to a host of factors that seem to be converging and alerting us to some imminent changes. 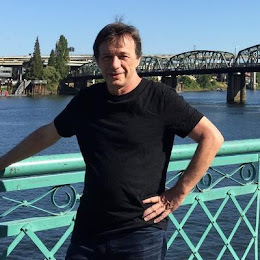 Both Glenn Neely and Robert Prechter are suggesting the move up from March has just about reached it's most likely conclusion, reaching or close to reaching ideal targets in terms of price (Prechter & Neely) and time (Neely). In addition, Arch Crawford wrote in his August newsletter that, "September is a truly ugly month right from the start - Overwhelming negative aspect count." Let's walk through my most salient charts and analysis to see if we can't identify any triggers to nastiness, so as to be ready when Ms. Market yells, "Pull." 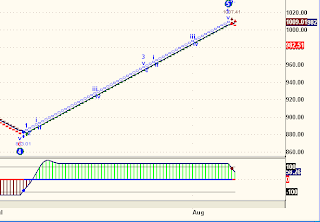 On the Monthly chart, with one day left in August, 1029.80 still prevents the ATR system from flipping positive. 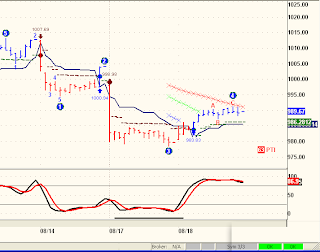 Blue Wave is four months into it's Buy Signal and won't flip Short until the 830's. 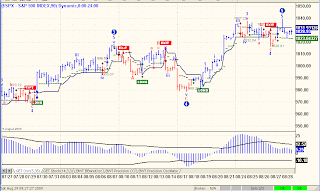 On the Weekly analysis, we still see a triple divergence on the False Bar Stochastic as well as a stubborn wave count and pattern from Advanced GET warning of new lows to come. I've drawn a trend line that is walking up with price and is sitting right now at about 963, almost exactly where both Blue Wave and ATR will flip Short. Take note. The 90 minute chart shows an Elliott Oscillator on the bottom, highlighting a significant divergence between the oscillator and the recent new high in the SPX. 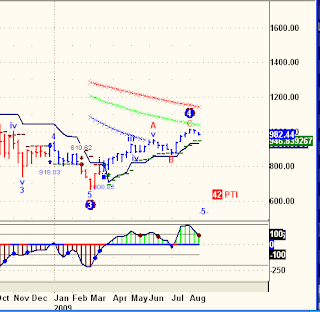 Note also that while Blue Wave is still on a Buy on this chart, that ATR (solid navy line) is Short. 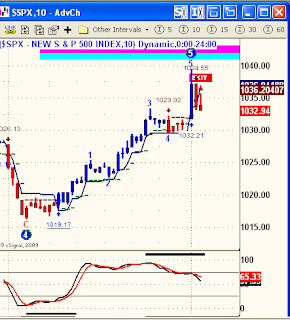 Blue Wave triggers SHORT at 1023.04 and ATR triggers LONG at 1031.93, all basis 90-minute bars. 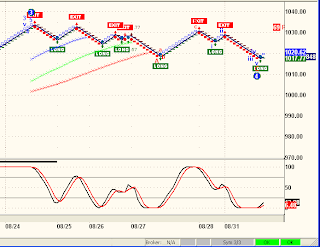 The 30 minute chart above shifts near-term focus to some tighter levels. 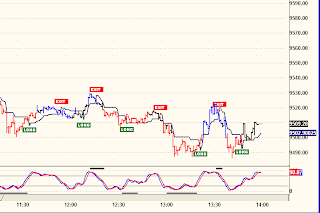 Here, ATR is already on a SELL, requiring a 30 minute close above 1031.67 to flip Long. 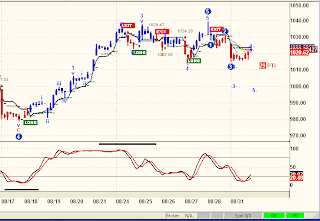 Blue Wave is again LONG here, requiring a 30 minute close below 1025.56 to join the ATR being SHORT. In summary, the SPX closed Friday at 1028.93. Our trend-following systems are mixed, reflecting indecision, distribution or accumulation, take your pick. 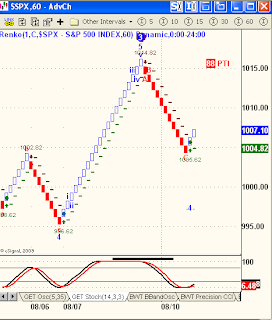 A thirty-minute bar that closes above 1031.67 or below 1025.56 will be the first indication that both systems are in agreement on near term price direction. 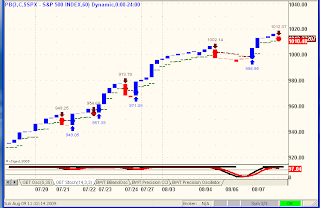 Here are my intraday charts with a SHORT trade set-up. 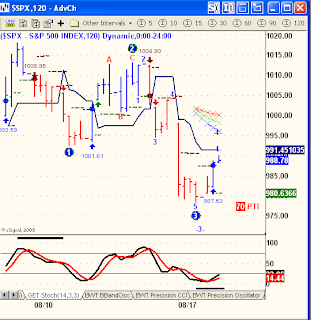 Using SPX 1040 as a stop, this short-term SELL could turn into the trade of the year. Too early to tell, nonetheless, every intra-day SHORT is being considered by me as a potential trigger for downside fireworks. 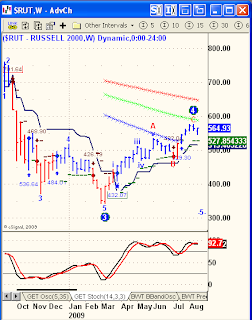 As someone posted in the Comments of my previous blog, Robert Prechter did issue an interim alert this morning suggesting that the entire rally from March has reached his ideal targets right here, right now and to return to 100% SHORT. For $20 a month, his Elliott Wave Theorist might be the best available bargain in subscription market commentary. 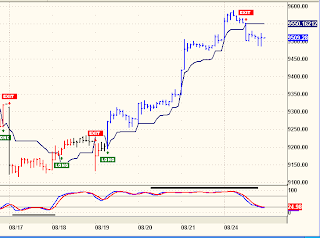 To recap, based on intra-day Sell signals, I'm SHORT and using today's highs as my STOP. 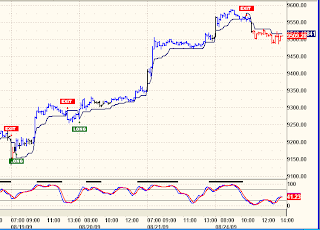 Above is the 240 minute SPX chart. 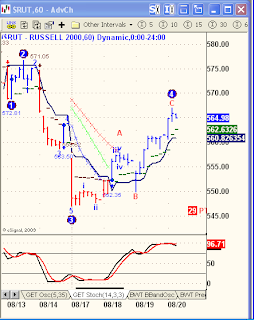 Note that Blue Wave triggered a Sell soon after the Open today, but that the ATR (navy line) is holding, so far. The market has moved higher since you called for a top. Is that a failure of wave theory or did you make a mistake or misjudgement? You can click on the link above to read Glenn's answer. As for me, I posted The Bullish Case yesterday and already the questions are coming if I am turning Bullish. My outstanding forecast since March has been that after a brief relief rally, the market will turn down and make new lows. It's been five months, going on six and nothing I have seen has changed that forecast. What does "brief relief rally" mean? The market declined for 18 months, a relief rally that consumes 1/3 of that time as this one has can arguably be considered as longer then "brief." Or maybe a rally that retraces only 1/3 of the down move can be considered "brief." It doesn't matter. I could be wrong about the brevity of the rally, without being wrong on the big picture analysis. That seems to be what is going on here. 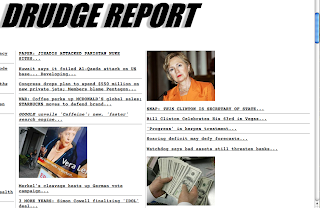 As for yesterday's "Bullish Case," yes, I could be wrong about the whole damn thing. That scenario outlined yesterday may be why. But as I sit here five days shy of the end of August, my forecast stands. As Glenn points out in his answer, not every twist and turn of the market is foreseeable. Some patterns are clearer then others. Some stages of advances and/or declines are easier to predict then others. Almost one year ago, I posted Crash Warning which is why many of you readers have found your way to this blog. At the time, I thought a market crash was imminent. That consisted of forecasting a crash and timing it, the "imminent" part. Maybe one of these days, maybe soon, I will post Crash Warning II. All I can say is that it is far more likely that I will post Crash Warning II then Buy, Buy, Buy. 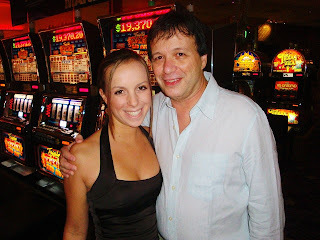 In the meantime, this whole house of cards can come crumbling down without my posting either of the above-named blogs. That's why so many of my charts are designed to identify tradable trends. Like the one I will leave you with below. Note the TREND. Note where the TREND REVERSES. Note what you will do if one......then the other. What do we make of this? Looking at the previous signals generated by the ATR model, grudging respect IF 1029.80 is exceeded on the close next Monday. 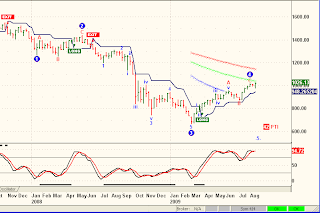 As for the wave count, geeziz, I had to use a Monthly chart going back to the end of the last century to come up with anything resembling a bullish EW pattern. Nonetheless, it's there. 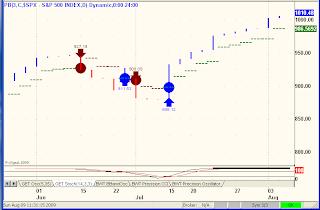 This whole idea of a a "huge irregular corrective wave," comes from Don Wolanchuk, King of the Perma-Bulls. Who knows, maybe he's onto something. But I'm not on board, not yet, anyway. 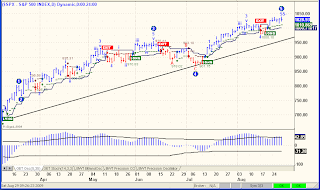 A week ago I posted a Monthly chart using an ATR_TrailingStop strategy brought to my attention by one of the readers of this blog. 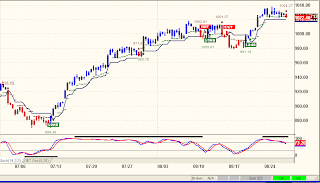 One week of trades using the ATR_TrailingStop system. Can you make money trading this? If you can't, you might be in the wrong business. Combined with the False Bar Stochastic, this is a powerful indicator. All of this because one of you was considerate enough and generous enough to share a trading idea. This is what AllAllan is all about. I think most of you get this, but from a few Comments, some of which never saw the light of day here, there remains some confusion about my charts and analysis. 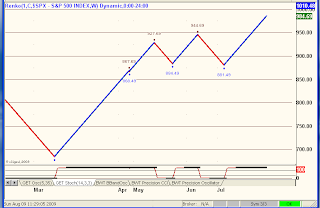 The above chart is a Weekly SPX with two analysis methodologies applied. 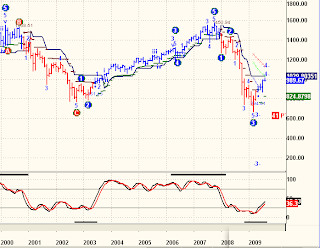 First, an internal Elliott Wave count which is suggesting an uncompleted cycle down, i.e. 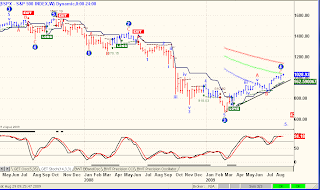 a Wave 5 is still to come to new lows. 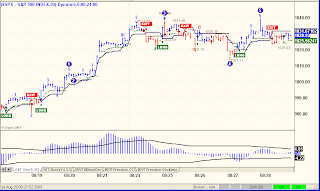 Also included is an ATR_TrailingStop indicator (LONG/EXIT-SHORT), that signals price bias without regard to the EW analysis. These are longer term signals, not trading signals, but they do a pretty good job of staying on the right side of price direction. 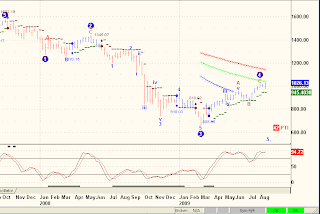 Meanwhile, EW analysis is suggesting where prices are in the cycle and what to expect next. 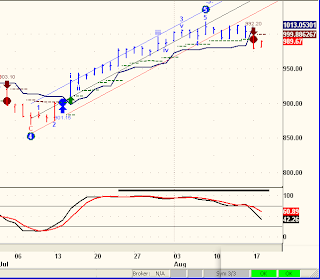 Here is the same chart, only I've replaced the ATR_TrailingStop indicator with the Blue Wave Trend indicator. As with ATR_TrailingStop, Blue Wave does a decent job of getting the prevailing bias in price direction right, but does not use EW in any way, shape or form. The are two completely different methodologies, useful in their own special ways. I have been providing both indicators in almost all of my charts as I believe both views provide valuable insight into where prices are and where prices are going. Drilling down into smaller time frames brings commensurate insight into current and future price action. Some of you get this, some of you are confused by it and some of you manipulate the information provided to submit snide remarks about this free commentary and analysis. It takes all kinds to make a market and I need only review the nature of submitted comments to differentiate between the winners and losers out there. Those of you in the middle, who find yourself fascinated but confused and want to learn, hang around and be patient, it's coming. "We will be watching sentiment and momentum closely for divergences and other signs of exhaustion in the days ahead; the decline that follows the next peak should be one for the record books." If you ever considered subscribing to Prechter's services, this is the time to take a look because in the next few weeks the trade of a lifetime is expected. You can click any of the Elliott Wave International links on this page (in which case I get credit) or you can go to their web site directly. The quote above is from tonight's Short Term Update, used without permission, but I don't think they will mind in light of my nice plug above. I'm not sure who "Punisher" is, but his explanation of where the markets are right now is pretty much the prevailing view of Robert Prechter and other mainstream Elliott Wavesters. 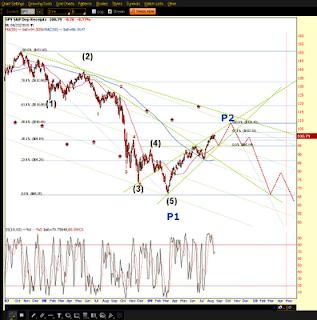 On the above chart and according to this view, the markets are completing Wave 2 Up before a Wave 3 Down in what is a multi-year bear market, with Wave 3 ending sometime in the 2011-2012 time frame. 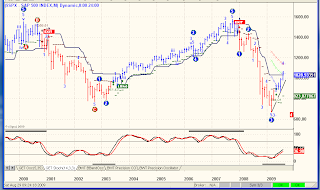 "The last grand supercycle correction that we had was the south seas bubble in 1720. It lasted some 60+ years. 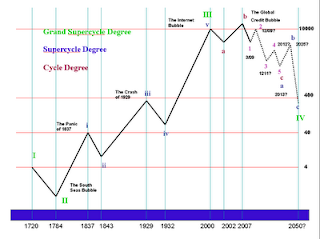 According to Prechter, we have finished our last grandsupercycle and have started another correction that could last 40+ years. Certainly there would be many bull rallies or even bull markets within that time period. However, prices would continue down over the long haul. The last two supercycle corrections were the Land Panic of 1830's and the Great Depression. So that should put things in context. Prechter's long term target for the Dow is 400 at the end of it all. This next leg down should be deeper and longer in % of terms then the first primary degree wave down we had that ended in March. So we should look for a 60-75% hair cut to the indices once this primary wave 2 finishes (which it may have already, but we won't know for sure until price confirms it). I hope that helps." 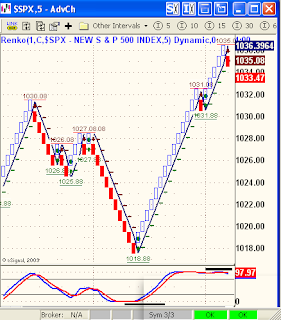 Meanwhile, the False Bar Stochastic is showing a nasty set-up if 1018 is not exceeded on this run up. 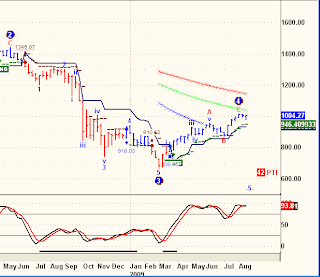 Either 1018 is taken out, or entire rally up from Wave 3 low is retraced.........and then some. 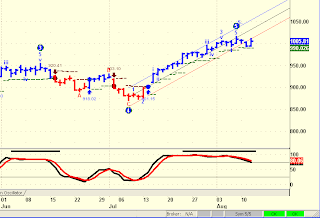 This is a Weekly chart and Weekly analysis, not for short term trading, but for big picture outlook. Here, a completed five waves down into March low as Primary Wave 1 Down and now close to completing a Primary Wave 2 Up, to be followed by critical Primary Wave 3 Down. "This sort of disruption in the economy, given where it is now, guarantees a contraction of GDP of 10% or more from the top, which is the definition of economic depression. We can argue about "how bad of a depression" later." Note it will take a move back up over 999 to return this chart to Bullish mode. They all work, commensurate with trading styles. I use 30 minutes and under for intraday Scalping, 60 minutes and over for Swing trading and Daily/Weekly for Intermediate Trends which usually govern what side of the smaller time frame charts I trade. 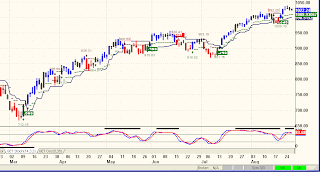 Thus, there are multiple "Sell Signal Thresholds" that are discussed here. 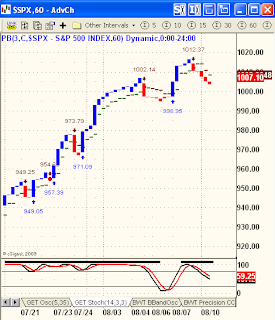 Needless to say, a Daily-based Sell (as per above chart) is significant. 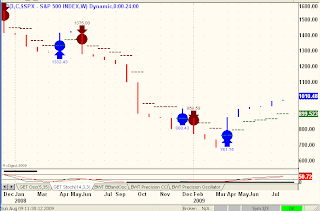 Prices broke below the indicator in December, 2007 and have stayed below it ever since. 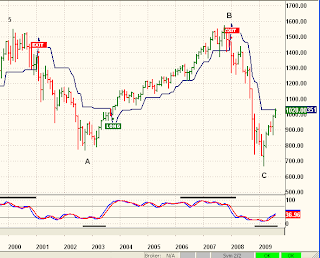 It will take a Monthly close above 1030 for this indicator to issue a Buy. It will take a drop beneath 986 to suggest a drive significantly lower has begun. This may be a far cry from orthodox EW analysis, but my focus is glued to entering Short at the right time to reap the rewards that have been so elusive for the past six months. You want the bullish case? Turn on your TV, or call your broker. They are all over this new bull market. I was just informed by Elliott Wave International that one of (edited by APH) the latest Elliott Wave Theorist[s] by Robert Prechter is online free to all. *Edits inserted by me an hour after original post, as I mistakenly assumed it was Prechter's latest newsletter, the one that said it was time to get short again, the most important issue of his in years and the one they should be giving away, instead of an old one and a sales pitch. My bad, apologies all around. To reiterate so there is no misunderstandings, this very bearish wave count on the 2-hour chart only becomes a serious consideration if that wave 3 low gets taken out with a powerful wave down, sometime later today or at least no later then Wednesday. I'm still in Vegas one more day, but I wanted to show a couple of S&P charts that include this morning's first 90 minutes of price action. It was forty years ago this weekend that I traveled from a hot Detroit summer between my sophomore and junior years at Michigan to New York City, where a couple of friends picked up Claudia and me (Claudia was my first) at LaGuradia and the four of us drove their little blue VW bug up the New York State Parkway to Max Yazgar's farm. 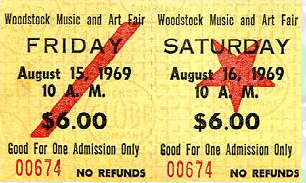 Jerry Garcia from the Grateful Dead is dead, as are The Who's bassist John Entwistle and drummer Keith Moon. The band's guitarist Pete Townshend, 64, after years of "Tommy Can You Hear Me?" is mostly deaf. David Crosby, 68, had a liver transplant and former band mates Neil Young and Stephen Stills, 64, have survived brain and prostate cancer, respectively. Twenty-one years ago Saturday, 19 years after the 3 Days of Peace and Love, my first child, my baby daughter Sarah, was born. My wife had gone into labor the night before and I had been up all night with her and the assorted medical personnel at Northside Hospital in Atlanta, coming and going, worrying and relieved, then worrying again, all culminating with me along side a drugged out split-open and conscious spouse, as Sarah Michelle Harris slipped out into the light of life, with smiling, loving faces and hands all around. To celebrate the 21st anniversary of this seminal event, Sarah and her friends are flying out from South Carolina to Las Vegas this weekend where I will meet up with them from Phoenix for another 3 Days of Peace and Love, Drinking and Debauchery and a Father & Daughter moment that will mark the beginning and an end, a cathartic phenomenon of my own life, my own living, breathing, feeling and all to human, Woodstock Nation. Already there are persons that were a part of life long ago who have passed. Some I just knew from afar, others nurtured and taught me, getting me ready for the 40 and 21 year cycles that no one knew would come, and then one who but for the grace of happenstance would have been the mother of my children, who passed too early, inexplicably and alone. Those were reckless days, we were reckless people and our time was filled with reckless wonder. That was your life, mate. What stays with us along this understated path? Family, memories, mysteries, happiness and sorrow. So we cling to vestiges that keep us connected, photographs, music, the Detroit Red Wings, headstones, Thanksgivings, tears and of course, the rain. This will probably be my last Blog for a few days. 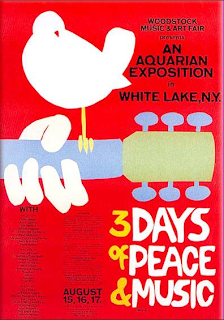 Bigger themes demand my attention, a spontaneous romp with a younger generation, balanced all the while by the common celebration of this group, many of whom weren't alive, or even contemplated, in the time of those muddy fields of peace and love, some 40 years ago. All brought together by my first born daughter who for awhile, maybe longer, will be the center of our universe. Life can be wondrous and innocent, it can be tragically dismissive and so full of sadness I can hardly breathe. As it was in a rain soaked field in New York in 1969 and in a bustling hospital in North Atlanta in 1988, life can be a sublime adventure, filled with the beauty of spectacle that reaches deep into your heart, into your soul. Notice how prices dropped out of the Wave 5 up channel on Tuesday and then came back to kiss the channel one more (or last) time Wednesday. 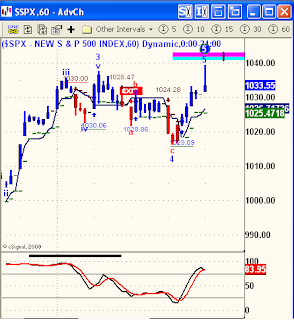 Note also the Blue Wave derived reversal level of 990.02 which if breached, would constitute an Intermediate Sell Signal. Finally, although the False Bar Stochastic is in Trend mode (for now), one can't help but take notice of it's precarious position and the ramifications of price weakness in the next few days. Our story is getting out. Enjoy the ride. 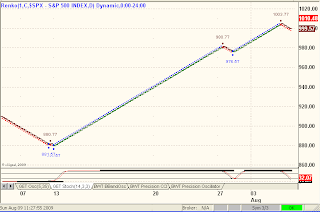 Going into Monday SHORT, the chart flipped LONG in the last hour of trading. 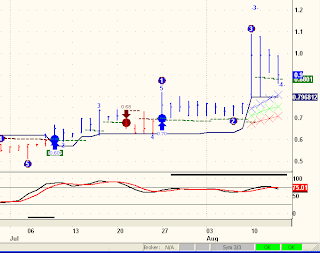 Note how the False Bar Stochastic is about to trigger a BUY signal. 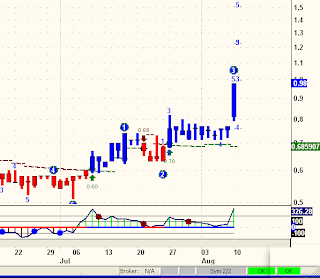 At the close Monday, this chart gave NNVC a Wave 5 target of $1.85. 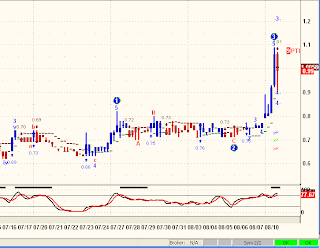 Impulse wave projecting initial move to $1.50. Impressive volume and prices holding up into the afternoon. 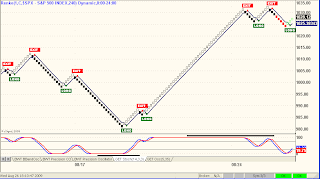 Are these signals tradable? Those are some very impressive trades across the board, from Weekly to Daily to Hourly. Labeling these trades in retrospect on a Sunday afternoon with a ballgame on in the background is one thing, trading the actual signals in real time with CNBC blasting and multiple models singing, well, that's quite a different situation. Mill's On Liberty addresses the nature and limits of the power that can be legitimately exercised by society over the individual. One argument that Mill develops further than any previous philosopher is the harm principle. The harm principle holds that each individual has the right to act as he wants, so long as these actions do not harm others.